Present Past Times – talking aloud on subjects close to my heart. Happy New Year to all of you and I hope it will bring unity and peace to the world. With so much strife in the world and the resulting overwhelming number of refugees and economic migrants forced to flee and find a more peaceful place where they can live, my thoughts have been very much on my own place in the world. My Dad came to England in 1932 to seek a better life, well not strictly speaking to seek it in the UK but in the good old US of A. Having got sidetracked he ended up staying in England; he didn’t come as a refugee and he wasn’t fleeing conflict happily. He had a British passport as Cyprus was under sovereign rule at that time; regardless, I am the daughter of an immigrant. I have never thought of myself as anything but British with maybe an added foreign element; when I visit Cyprus I increasingly feel myself to be part of that country as well. People have asked me in the past whether I feel British or Cypriot, in my eyes a strange question as I feel like me which is to say I am a mixture. I have always been proud to be both and I love the land of my birth, Britain. With so much talk in Parliament and on the news about immigrants, mostly about how to keep them out, I have felt more and more of the foreigner and yes a little bit alienated. The British Isles has a history of invasion by many cultures and countries, before them all were the original Britons of Celtic origins; my mother was of Scottish decent; her maiden name was Anderson which in turn is also of course Scandinavian in origin. First came the: Romans; Normans who were themselves originally Vikings; Saxons and Angles both from parts of Germany and the Danes. More recently we have had settlers from every country under the sun and it has made for a rich and varied culture. For a country with so many cultures and religions on such a small island we all rub along surprisingly peaceably on the whole. But with the ever prominent Islamic fundamentalists causing mayhem around the globe it has caused tensions. I have always been proud of my surname and whenever the need arose to give my name on the phone the response has always been one of interest and amiable conversation.Recently however it had a very different effect, one of suspicion. This was a conversation with employees within the Work and Pensions department; in this instance it instigated a batch of questions asking me to prove my British nationality. Although I understand perfectly why this occurred it didn’t alter the feeling it created in me of us and them. I somehow felt myself to be on different ‘side’ to the person on the other end of the phone instead of feeling part of the British Isles, I felt for the first time in my life a foreigner in my homeland. It was slightly unnerving. I have had a taste in a very very small degree of how it must feel for say a British Asian or a British born Jamaican or African. Our present government has a lot to answer for not least for giving the general impression that ‘we’ are pulling up the drawbridge and going into siege mode. Maybe the next step might be to throw a few of us overboard…who knows? We live in a material world but my idea of materials may not be the same as yours. As long as I can remember I have loved the smell of graphite and paper, the texture of fabric: silk, cotton and wool.One of my memories from childhood is of the walk home after a visit to the dentist in the Town Hall with my mum, where I’d been through a bit of an ordeal, We passed by a small shop that sold all kinds of pads and pencils and cut out books. Usually after a trip to the dentist if we had been good, as a treat my Mum would buy us something from the shop, on this occasion, as a special treat she bought me this cut out book of a farmyard. I spent the rest of the afternoon happily cutting out and assembling this one dimensional farm, I can even remember the particular green and brown of the hurdle fencing. Next to the complex of buildings that housed the Walthamstow Town Hall, Assembly rooms and the Polytechnic there was an art shop called Vandy’s. it had been there as long as I can remember and is still there 40 years later, whenever I walked in the door that familiar smell of graphite and paper wafted up to greet me. For a time I used to go to life drawing evening classes at the college and the go -to place for all the art materials was Vandy’s. The pleasure of choosing the right pencils and cartridge paper, in those days bought in elephants and double elephant sizes which is what they will forever remain in my mind, was a real pleasure that has stayed with me throughout the years. When I worked in the Painted Furniture studio in Chelsea, I was occasionally entrusted to buy the required art materials from Green and Stone in the KIng’s Road as I passed the door on my way to work. Clutching the list I would enter this Aladdin’s cave of treasure, at least twice the size of Vandy’s it would be stacked from floor to ceiling with, brushes of all shapes and sizes, paints: water,oils, gouache, pencils,crayons, pastels papers of varying colours and textures. I was allowed to handle these precious materials in order to pick my preferred items. I felt so privileged to be allowed to wander amongst the enormous range of artist’s materials and wonder at the variety of ways there existed for making marks on paper and canvas. In amongst the materials would be a whole host of other accoutrements pertaining to art, I could have spent hours just wandering , looking and handling had I been allowed. This wonder and sheer pleasure has remained with me throughout my life and whenever I discover a new Aladdin’s cave to explore and gawp at I will be filled with happiness – little things. A wonderful shop that is the positive crême de la crême of all art shops is Cornelissen in London. A cornucopia of delight not only does it sell art materials but everything that the artist or craftsperson could want, from leather working to water gilding. So on top of the wonderful graphite and paper aromas, there is leather and glue mingled in mmm.. heaven. This shop is wreathed in history as it was established in 1855 and can be found near the British Museum. It has a vast array of artist’s pigments lining the shelves which dazzle the eye with their glorious vibrancy that make you want to take them all home and just gaze at before diving in and using them.It’s the sort of shop you could imagine Turner visiting to choose his canvases and colours, indeed he might well have done so. For me the fine art emporium is full of romance and possibility. Once I had a commission to decorate a piece of furniture in Chinese red laquer, this used to be achieved by using a pigment called Dragon’s Blood, now doesn’t that conjure up images of romance and adventure from the imagination? I managed to find a place that still supplied this exotic substance and the colour is wonderfully rich when layered up. 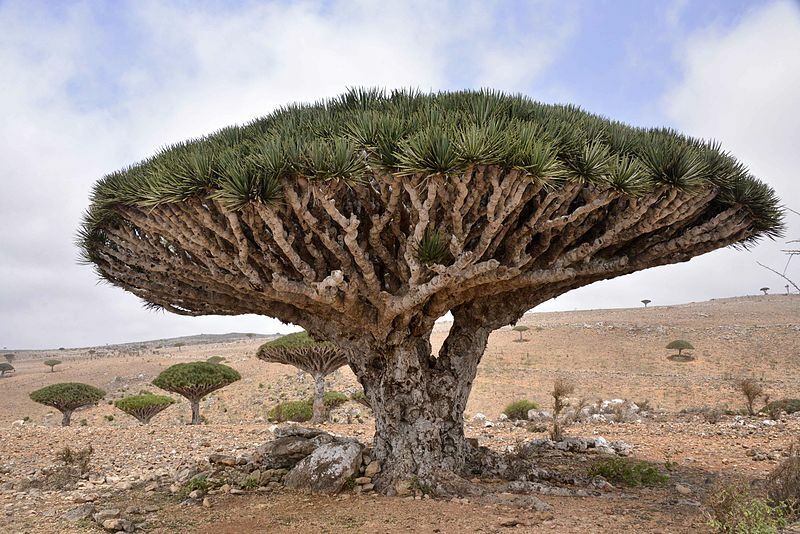 It isn’t made from actual dragon’s blood (sigh) but is from a tree called the dragon tree found in Africa and Asia. There is a cupboard in my kitchen where I store all my art materials and I still get a thrill when I take out the bottles and papers to start a project however small. It will never leave me and I hope it will remain a comfort and pleasure as long as I live. Now not many people can say they have a seven foot obelisk in their garage! But I can and the reason it is there is that it’s resting in between homes. Many years ago in the 1990’s I was invited to exhibit at an interior decorator’s fair at Earls Court, I was offered a one metre square space on someone else’s stand. Now what can one exhibit on one metre square? I decided on a seven foot obelisk because it would serve not only as an area to demonstrate my marbling skills and finishing but also function as a display module for leaflets and photos of some of my other work. The base which is hollow of course, has a panel that comes out allowing me to use the interior as a storage space for putting my coat and bag out of harms way. I designed it and drew up the proportions on a plan myself and took it to some colleagues who make and restore furniture. They made up the module out of mostly MDF ready for me to paint. I am quite proud of my obelisk and it is certainly impressive in the flesh. Originally I decorated it in green, my colour of the time, with lettering up the sides of the top part. A few years later a customer of mine wanted to use it as a display in his antique shop and asked me to paint it with a black surround with Sienna marble panels and detail. It did look a great improvement , I wished I’d thought of that colour combination for the exhibition.Even later it was displayed in the foyer to a restaurant. I had a period in my furniture decorating career where I designed and had made, lamp bases, which I then painted according to customer’s requirements. One of these designs was an obelisk based on a classic design used in interior decoration. Obelisks are very architectural, originating in Egypt as far back as 2484 BC according to the Archaeology site. In Napoleon’s time there was a great revival of all styles Egyptian although these styles have been used in architecture since the Renaissance. 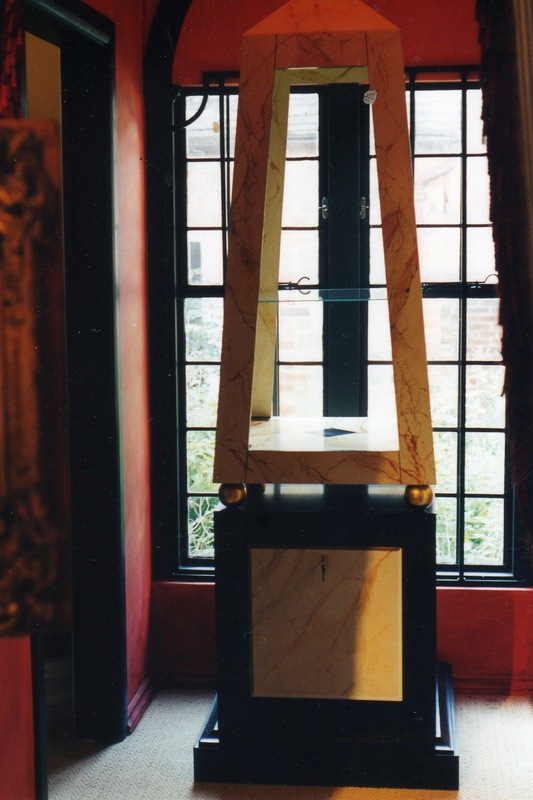 Obelisks were reproduced as small decorative objects for interiors of houses to adorn mantlepieces and shelves often out of marble.Following this practise, I had some reproductions made from wood and decorated them in various marbles and simulated woods, from malachite to porphyry to satinwood. I was even inspired to decorate a pair in the style of Fornasetti. Piero Fornasetti was an Italian painter, sculptor and interior designer who died in 1988. He designed pieces of furniture and objects, decorated in black and white mostly. The majority featuring one particular face of a woman who inspired him. Other works featured the sun and time. But the furniture that I found fascinating were the pieces that featured decoration that was sort of trompe l’oeil in execution. Cupboards were created and decorated to look like miniature buildings with openings that looked like windows and doors. I read that he was inspired by Greek and Roman architecture. I decorated my obelisk with black ink on a cream background, with a selection of Palladian style windows making them look a bit like towers with a door on the bottom floor. I was really pleased with the result and had great fun doing it. Sadly I didn’t take a photo and I wished I had kept them for myself but gave them to my sister ,who is an architect and so too is her husband, also a fan of Palladio. As I am sorting through all my belongings at the moment with the thought of moving I am trying to find a home for my 7 foot obelisk. I am very fond of it and if I had the space would happily keep it in the house but alas my house is very small. So far I haven’t had any takers on ebay but I will keep trying. 2013 The Year of Positive Comment. I haven’t treated my body well over the years, not because Iv’e enjoyed a hedonistic lifestyle or had fun in the process, maybe I would derive some satisfaction from that, at least have a few pleasant memories to look back on. No, I have worked it into a ruin. Admittedly I have had more than my fair share of accidents along the way , breaking bones and twisting parts that shouldn’t be twisted in ways that didn’t do them any favours. But to add insult to injury I always carried on working, not giving myself time to pause. I didn’t have a job where I was sitting down in a nice warm office either,oh no, I was doing hard physical work involving, bending and stretching and rubbing and painting, always on my feet and without any breaks. Who was this taskmaster who was so cruel as to make me work in such a way without any respite?….why myself of course. I have been self employed for over 35 years and my experience of all self-employed people is that they are their own slave drivers. It goes with the territory. Many self employed people feel obliged to work every hour there is otherwise they feel guilty. But a better way would be to achieve a balance between work and pleasure. Because without the pleasure and a break from the work, we loose perspective and consequently our work suffers. Even when we are working at something we enjoy and gives us pleasure, we need a change of scene now and then to remind us there are other things in life. In the end my body told me it had had enough and it coincided with my work drying up, quite neat really, forcing me to pause and reflect. I spent many years trying to unravel all the knots I’d tied myself into and now today I’ve been trying a different type of twisting and stretching to get those muscles to enjoy the pain. I’ve ventured into the blogosphere, I never thought I’d see the day and today it arrived. Now it’s come, it will take me a time to gather my thoughts and try and make some sense of them…always a bit tricky but practice makes perfect and that’s the idea of starting the blog. I’ve just completed my first book, and like anyone who has given birth, I’m glowing with pride at my creation. But I’ll have to contain my enthusiasm for a while longer while the process of getting published progresses….. however that manifests. The blog is a way of getting rid of my frustration at the slow progress or so it seems to me, as well as a narrative of my journey up to this point. I’m a Sagittarian and we like to gallop along and feel the wind in our hair, at the moment I’m sort of grazing , that’s good as well of course, have to get the nourishment to be able to gallop. Most people at some time or another in their lives say they would like to write a book, it wasn’t one of my ambitions in life. And yet here I am having written one. It came about because the opportunity presented itself, and I, without hesitation, took it. I was on holiday in Cyprus, visiting a cousin who lives in the mountains in a traditional house which she has restored. Surrounded by the traditional artefacts with which her house was furnished and hearing about the traditions of the village way of life, I started to wonder how these traditions are holding their own in the 21st century. From these musings I started to think it would be a good idea to record some of the food traditions in some way and the idea then came to me, I could do that and investigate how the traditional crafts of basket making, weaving and pottery have evolved. This took me on a journey and the book was the result photos and all. To be honest I had as much fun doing the layout on Blurb as I did writing and researching it, the whole thing was a blast. I got a huge amount of satisfaction from the whole process because through it I strengthened the connections with my dad’s family as they were involved in the project, I got to satisfy my curiosity about some of the crafts and met some of the modern day craftsmen , I got to record some of my favourite recipes and all this gave me a far greater feeling of connection with the island and my dad, who is now long gone. I have had many holidays in Cyprus in the past but the ones I remember most clearly and with most affection were the early ones before the Turkish invasion. In those days my dad’s family still lived in their village on the outskirts of Lefkosia, when you visited everybody knew and as you were within walking distance of nearly all of them it was easy for people to drop by. Now with the family scattered across the sprawling city of Lefkosia, it takes more effort and involves car journeys along busy main roads, a bit like London with a lot more dust and heat. I lost that sense of connection with the authentic Cyprus ,through writing the book I found it again.